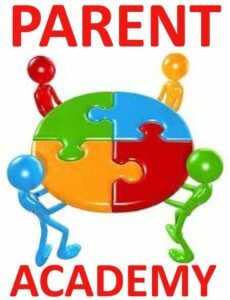 On Thursday, December 6, 2018 from 5-7 pm we will be hosting our first Parent Academy. All Parents are urged to attend. We will have professional facilitators discussing topics during this time. Parents can choose up to four sessions to attend. We want to encourage and empower all parents to have knowledge and resources to help our students success. Students who’s parent(s) come will receive a free dress pass and a free homework pass (not used for a test). Hope to see you there. Save the Date!!! !